Welding Protection Equipment - TITAN – Zika Industries Ltd.
Home Catalog Personal Protection Equipment Welding Masks Welding Protection Equipment - TITAN – Zika Industries Ltd.
Quality materials and design features insure the best helmet available for any job. All Titan welding helmets are made of nylon, which is lighter than fiberglass and extremely durable. 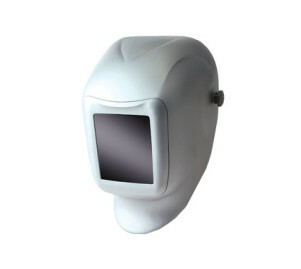 The patented award winning design of the Titan provides the user with a balanced lightweight, economical welding helmet. The 5-1/4″ x 4-1/2″ front load bezel provides easy loading of filter, cover and protective plates. Extended crown provides greater overhead protection. Rigid bib deflects welding spatter. Uses standard size filter, cover, impact and magnifier plates. The new and improved ratchet headgear suspension allows user to adjust size and tighten or release at the pull of a knob. Meets ANSI Z87.1 standards and is CUL certified to meet CAN/CSA-Z94.3 standards.